A couple of weeks ago, I traveled to Japan while the country was hit by the heaviest snow and coldest temperatures in recent years. This winter vacation packing list shows how I prepared to survive my trip to the Japanese winter wonderland in freezing weather. I’m a wimp when chilly wind blows. Blanket becomes my best friend. I love to cuddle with my dog under the blanket and fall asleep while watching a movie or reading a book. But that doesn’t stop me from traveling. Because I don’t function well in cold weather, I need to be extra well-prepared. Before I knew, I became an expert in packing for winter vacation. Here are the winter vacation packing tips based on my own trials and errors. 5. Get those Disposable Heat Packs! 6. Dehydrated skin needs extra moisturizing. Part 8. 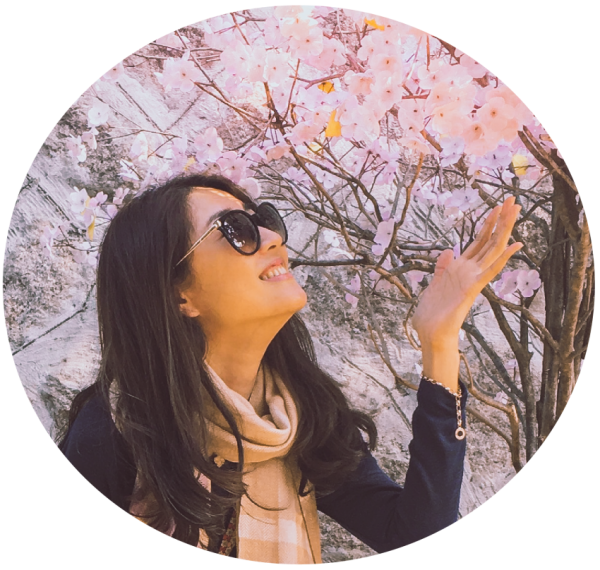 What to Wear in Japan: Japan Winter Season Edition ? I can’t emphasize enough the importance of layering. Layering works way better in retaining heat than wearing one thick jacket. And did you know there is a smarter way to layer? The first layer directly contacts to your skin beside your underwear. I like to keep this layer snug. Choose wool or synthetic. Cotton doesn’t retain much heat. I love Uniqlo Heattech leggings (similar here) and heated thermal shirt (similar here) as the first layer. They not only keep me warm and toasty but also protect my sensitive skin from getting irritated by wool sweaters. This innerwear, made of synthetic materials, wrap your body as if they are another layer of your skin. Did I mention they are also moisture-wicking? The mid layer for insulating is worn over the first layer such as sweaters and pants. Besides its warming function, packing cashmere or alpaca sweaters is a much better use of precious luggage space than other bulky winter sweaters because they are so much lighter and thinner. My personal favorite is soft and fluffy alpaca wool! Additionally, I highly recommend getting travel vacuum storage bags. These bags are the champion of space saver! It’s incredible how much air gets sucked out. Usually, compression bags for travel is a roll-up type rather than vacuum sealed. Put your sweaters in the plastic bag, “compress” the air out by rolling up, then zip it. No vacuum needed! The best compression bags for travel I used are from a local dollar store. (I also have used a regular vacuum storage bags with no vacuum, which saved much more space than using packing cells for suitcases.) As the discount stores can be hit or miss, I include links for more compression bags for travel here, here and here. For the bottom, opt for corduroy pants or fleece-lined leggings instead of jeans if you want to be extra warm. I often wear fleece-lined leggings inside a pair of insulated winter boots even when I’m not traveling. However, my first pick would always be jeans unless I travel to the extreme-cold region. Now you understand my inner struggle? We girls still want to look cute even when the temperature outside drops below the freezing point. Jeans can also work, but know that they don’t retain heat well. If you want to stick to your jeans, I would suggest wearing Uniqlo Heattech leggings underneath. I specifically recommend this brand because it’s thin enough to go under skinny jeans. The extra insulating layer can be lightweight down or fleece jackets. It can be worn on top of the insulating layer or without. Unless I’m going to an extremely cold-weather region, like a snowy mountain, I would generally skip this step. I don’t think it’s necessary to have two insulating layers for inner-city activities. It gets annoying to have to take it off whenever I go inside a cafe or museum. Regardless, I like to pack Uniqlo women's ultralight down jacket. It makes no difference in packing luggage because you can roll it up and stick it in on the corner. When you go out, it’s easy to bring it around in your travel backpack in case you need it in the evening. Or, wear it as the outerwear when the weather suddenly warms up. Uniqlo women's ultralight down jacket is a budget-friendly roll-up jacket, perfect for travel. But if you are willing to invest in more stylish, high-end one, you can check out Moncler down puffer jacket like this or Moncler gilet (padded vest). The outerwear is probably the most massive and bulkiest item. For winter travel, I usually pack one wool-blend coat for the classic look and one heavy-duty down insulated parka for the extreme weather. I usually wear the bulkiest piece on a flight so that it doesn’t take up too much space in luggage. If that’s not an option - e.g., because you live in a warm weather area, I highly recommend using compression bags for travel. Speaking from my experience, a little bit of investment will go a long way. When I was searching for the best heavy-duty down jacket, I first heard about Canada Goose from my Canadian friends. Although I trusted their recommendation, I hesitated a bit because I couldn’t justify a hefty price for a high-end winter jacket for the relatively warm Houston winter. I finally pulled the trigger when I planned a winter vacation to Seoul and Shanghai. Ever since then, this red Canada Goose jacket has been my go-to item on my winter vacation packing list. Most recently, I wore it EVERY SINGLE DAY for ten consecutive days during my Japan winter vacation to the Japanese Alps region and Tokyo. It's quite an investment piece yet the best down jacket I ever owned! I can’t seem to stop speaking highly of Canada Goose jackets (FYI, Canada Goose is not paying me for endorsing its brand). That’s because I very much appreciated their thoughtful design and construction. First, the entire jacket is built to protect you from any loss of body heat. The rim of the detachable hoodie is wired inside so you can shape it around your face. And it has the built-in wristbands, so no wind penetrates under the sleeves. The jacket also has so many functional pockets in and out of the coat to store everyday essentials like a cell phone and winter accessories like gloves. Two built-in strap inside the jacket come in handy inside the heated building; they allowed me to "hang" the parka on my shoulder instead of carrying it around by the arm. I mean, the designers have run every single scenario and put so much thoughts into creating this amazing winter coat. Most importantly, Canada goose down parkas will 100% satisfy even the biggest wimp for the cold weather (like me) with the warmth it provides! Each Canada Goose down jacket come with a different warmth level (“Thermal Experience Index”). I tried both women’s Kensington parka (level 3 “Fundamental”) and Trillium parka (level 4 “Enduring” for outdoor activities). They both were too warm for indoor testing at home. In the end, I chose Trillium as I thought it was a better value for the investment. However, you can determine which model you need based on your cold-temperature tolerance and travel destination. I like this white Canada Goose Loretta Parka or Moncler padded coat as well because they are so feminine and stylish. When the temperature drops, protecting the neck is crucial. When my neck is warm, I feel significantly warmer. In the extreme cold, I would even layer scarfs — one thin inside the jacket, another oversize blanket scarf outside. Scarf also makes a great statement on winter outfits. It’s versatile to wear as a scarf or shawl, and even work as an improvised mask. Good-quality winter jackets require some investment and can be bulky to pack. Instead of bringing multiple winter outerwear, by changing up scarfs, you can achieve different looks on your travel photos while saving precious space in your suitcase. A couple of years ago, I received an alpaca scarf from Peru as a gift. This has changed my winter shopping pattern forever! Alpaca is not only a cute animal I'm dying to see in person one day, but its wool is extremely soft and warm! Alpaca wool is not cheap; however, I'm a strong believer that investment in a quality winter gear pays back over time. If not alpaca (also see this elegant alpaca poncho), try cashmere or wool-blend scarf. Earmuffs, are you kidding? I graduated from them by the 3rd grade! That’s what I thought until I traveled to Korea a couple of years ago in its coldest month. I was bravely waiting for a bus outside for five minutes and started having excruciating pain in my ears as if they would fall off. Never again! Fortunately, earmuffs became a fashion statement for ladies so that many stylish earmuffs are available (here, here, here). If you are still not convinced to wear earmuffs, you can wear a beanie to protect your head and ears at the same time. And don’t forget to pack gloves. I recommend wearing a warm pair of touchscreen gloves. Taking off your gloves every time you want to take photos with your cell phone? Believe me, it gets annoying pretty fast. Check out these women’s touchscreen gloves: here, here, here. Nothing is worse than wet feet in the cold. Feet are the most vulnerable body parts as you might have to put your feet in the snow or on the icy road when you are traveling in cold weather. 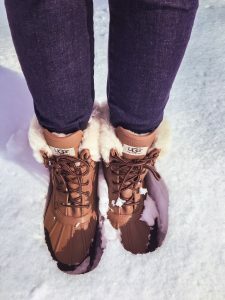 You can layer socks (try Uniqlo Heattech socks) or choose wool-blend socks to keep your feet warm, but you will need a pair of good snow boots that are waterproof (or water resistant), insulated and slip resistant (non-skid). When I was planning to visit snow county in Japan, I needed to purchase a pair of insulated slip-resistant boots. (I had a bad memory of slipping on an icy road in Korea and was bedridden for two weeks. I wasn’t going to repeat this mistake!) I will be honest. I wasn’t happy with what I found after searching for women’s insulated winter boots for a while. They are not the most stylish boots for ladies. Guess what? On the day I landed in Tokyo, snowstorm smashes the city with the heaviest snow in four years. I was glad to be wearing my slip-resistant boots! When everyone on the road is carefully walking not to slip, I strode the icy road in confidence. Do you think those disposable heat packs are silly? Then, think again. If you expect to walk outside for an extended period, I would recommend bringing some heating patches with you. My hands and feet get cold easily even with fleece-lined gloves and boots. Sometimes, I need to find an extra source of heat. That’s when these body heat packs come in handy. Try Japanese heat patches like this Kairo heat pack. I bought Japanese heat patch (photo on the left) at a drug store in Japan, which really helped me get through the day in the country's historic snow blast (similar: here, here). A cold wind comes with dry air. Cold air naturally can’t hold as much moisture as warm air. When we start turning the heat up, it only gets worse. This is why extra moisturizing is a must in winter. My beauty regiment changes at home as I notice my face gets drier in winter. It’s not a pleasant feeling, but more importantly, dehydrated skin can lead to more wrinkles. I switch out a gel-type moisturizer with a cream-based one (like moisturizer for dehydrated skin - full size, travel size) and add facial oil for dehydrated skin . I also use a Korean sheet mask (or this) or hydrating mask at least twice a week. 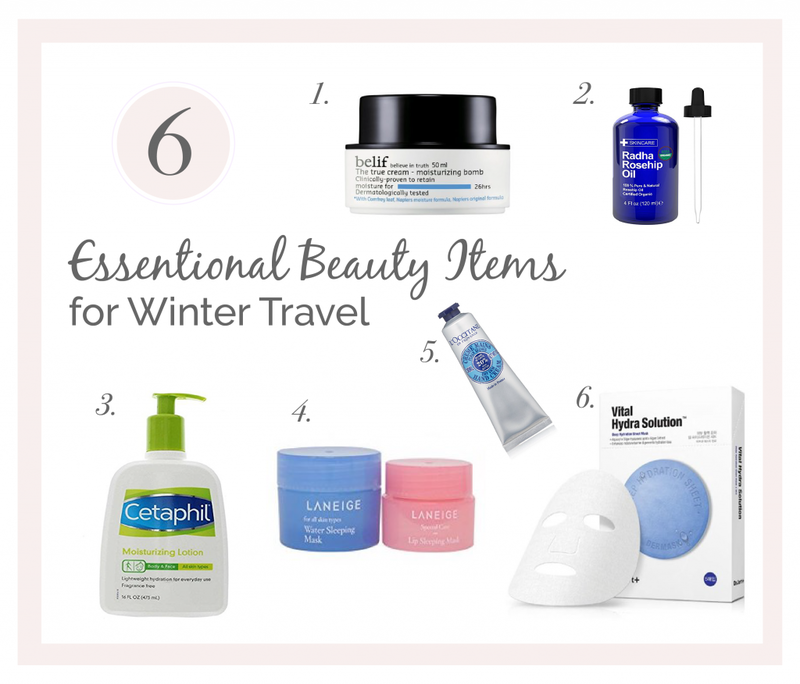 While I prefer to make the beauty routine as simple as possible when traveling, I prepare for the worst in winter because I most likely won't have the resources (e.g., a humidifier) I have at home. I like to bring those Korean sheet masks (this and this) that are easy to toss in my bag and use at the end of the day before my tired body jumps into a bed. I also love to use this Korean sleeping mask (travel size) and lip sleeping mask (travel size) that I can leave on overnight to protect my skin from the dry air in a hotel room. I use these sleeping masks on a long haul flight, too. (You know the air on a flight is super dry, right?) It's discreet enough that no one will know you applied a beauty mask on your face. Shhh! Other body parts also need extra TLC in winter. On day 2 of my Japan winter trip, I got dry hands; the cuticles around my nails had cuts and some of them even got stripped off, making it a bit painful. What about your feet, hair (travel size) and the whole body (travel size)? While everyone’s skin reacts differently to the temperature changes, be on the safe side if you are not sure. It would be troublesome to find a drugstore in an unfamiliar place and search the right product for you among unfamiliar brands. What happens dry air meet wool or fleece? Statics! I hate the unpleasant surprise when opening a door or taking off my wool weathers. So have you wondered how to get rid of statics on clothes? I make sure to spray all my winter outfit with anti-static spray BEFORE I put it on. I even spray on the wool lining of my insulated winter boots. If possible, I do this the night before. When I travel, I pre-treat clothes with anti-static spray (and dry) before folding them into the packing cells. Then, stick in some dryer sheets in between clothes. Once I get to my hotel, I spray Static Guard the night before I wear them. You might think it’s a lot of work. But that’s just how much I hate statics. In case you are concerned about airline security rules, it is safe to bring a travel Static Guard Spray (1.4 oz) in your checked in luggage. I usually pack the bottle in a plastic ziplock bag to avoid any leak inside the suitcase. Afraid of touching metal doors in your cashmere sweater? First, make sure your hand, body and hair have enough moisture. Wear a pair of leather gloves. It helps minimize the shock. Is this winter vacation packing list helpful? How do you prepare for your winter travel? Please share your secret tips below.